• PLOT SUMMARY: "Dealing from the Bottom" Written by Steve Englehart. Art by Tom Derenick & Mark Farmer. Parts 2 of the 3-part 'Double Trouble!' In issue #15, Star Girl, Vixen and Gypsy attempt to raise the stakes, but they find themselves at the mangling paws of a Wildcat gone mad! 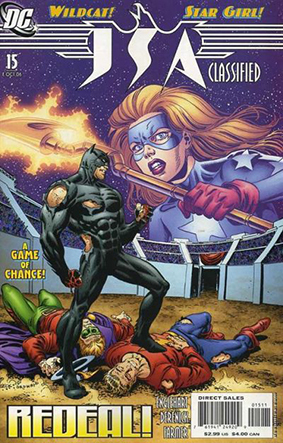 Can these three fare any better than the rest of the JSA, or will Amos Fortune and the Gambler succeed in cashing in the young heroines' chips?